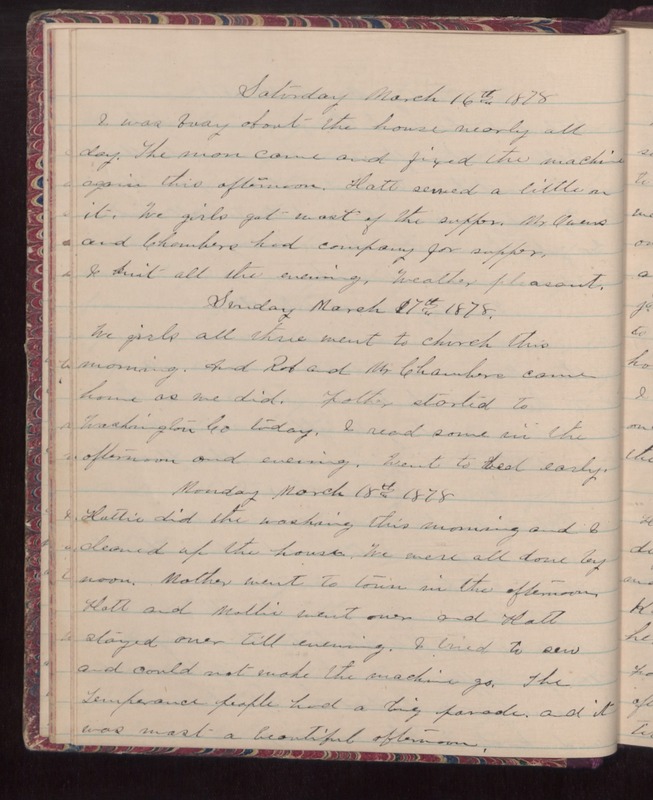 Saturday March 16th 1878 I was busy about the house nearly all day. The man came and fixed the machine again this afternoon. Hatt sewed a little on it. We girls got most of the supper. Mr. Owens and Chambers had company for supper. I knit all the evening. Weather pleasant. Sunday March 17th, 1878 We girls all three went to church this morning. And Rob and Mr. Chambers came home as we did. Father started to Washington Co. today. I read some in the afternoon and evening. Went to bed early. Monday March 18th 1878 Hattie did the washing this morning and I cleaned up the house. We were all done by noon. Mother went to town in the afternoon. Hatt and Mollie went over and Hatt stayed over till evening. I tried to sew and could not make the machine go. The Temperance people had a big parade and it was a beautiful afternoon.